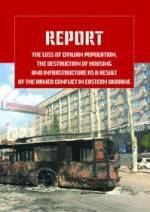 Report the loss of civilian population, the destruction of housing and infrastructure as a result of the armed conflict in eastern Ukraine / compiler Yevgeniy Zakharov; CO «Kharkiv Human Rights Protection Group». — Kharkiv: LLB “Human Rights Publisher”, 2018. — 116 p.